Fifty miles from South Miami, set in Caribbean blue waters is John Pennekamp Coral Reef State Park. One of only four US underwater parks, Pennekamp was recently cited as the third best scuba diving archipelago in the world by Scuba Diving magazine. Avid scuba divers save for a lifetime to make a pilgrimage to Pennekamp to see its wonders. As the third largest living reef in the world and the only living reef in the continental US, Pennekamp is a small part of a barrier reef system that stretches from Fowey Rocks in the north to just south of the Marquesas Keys in the south, 170 miles long. 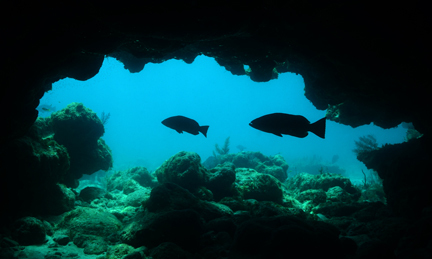 It is home to reefs with interesting names like Molasses, French, Dry Rock, Grecian Rocks, the Elbow, and Snapper Ledge. 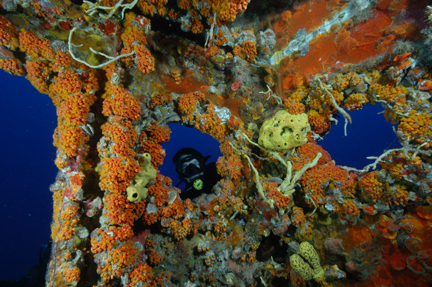 Molasses reef is arguably Pennekamp’s crown jewel. Its spur and groove reef structure starts at 10 feet, shallow enough for snorkelers and drops to 40 feet where scuba divers explore the canyons formed by 15-foot high coral walls. Some of the sand bottom canyons are wide enough for three-to-four divers swimming side-by-side while others will allow the passage of only one diver at a time. It is common to find nurse sharks or a variety of rays swimming in these canyons, using them as if they were an underwater highway system. Molasses displays a few remnants of man’s passage through this area long ago. Winch Hole is a large sand patch surrounded by coral reef with a large winch at its center believed to have been left by a sailing ship that ran aground here in the 1800s. Spanish Anchor, at mooring ball M21 is a classic arrow-headed anchor dating from the 17th to 18th centuries. From the surface the 10-foot anchor is clearly visible. To get up close and personal will require a dive to 40 feet. French reef’s contribution to Pennekamp is a reef system similar to Molasses but with wonderful swim troughs and large passageways through the base of the coral reef, some able to accommodate two divers at a time. Here sea-dwellers that prefer to stay out of the sun make their home. Dry Rocks, another spur and groove reef is home to Christ of the Deep more commonly referred to as the Christ Statue or “Touchdown Jesus” because of the outstretched arms. This 8.5 foot bronze statue is found in 25 feet of water and is popular with snorkelers and scuba divers alike. Cast from an original statue located in the Mediterranean off Genoa, Italy, the copy was given to the US by the Cressi family of Italy in 1961. A little south of Pennekamp is a reef called Davis reef. Davis is a ledge that sits in 10 to 20 feet of water and is 5 to 10 feet in relief. Among the many fish that inhabit the ledge, green moray eels and nurse sharks are commonly found lounging about. What makes Davis interesting is the Buddha. Many years ago someone, no one knows who, placed a statue of the Smiling Buddha on Davis reef. The Buddha thought to be put there in response to the Christ of the Deep, would be moved from location to location on the reef. Frequent visitors would never know when the Buddha would pop up around the next corner. On many occasions, Buddha would just disappear for a while, reappearing none the worse for wear. In 1989 Buddha was permanently positioned on the reef and can be found and enjoyed by visitors year round. residents of John Pennekamp Park. In 1942, the freighter Benwood collided with the Robert C. Tuttle and came to rest in 25 to 45 feet of water in what is now Pennekamp. During WWII ships commonly ran without lights at night to avoid detection by suspected nearby U-boats, hence the collision. The years and storms have left an interesting skeleton of a ship once 360 feet long and 51 feet wide. The Benwood was well-armed for a Norwegian ore freighter. When it sank it had 21 rifles, one four-inch gun, six depth charges, and 36 bombs. The City of Washington, a two-masted sailing vessel had a very colorful life above water. Now below, it has an even more colorful life. The ship had a very powerful steam engine onboard that made her very fast. City of Washington ferried passengers and cargo around New York, Havana and Mexico. In Havana Harbor when the USS Maine exploded, the City of Washington helped collect survivors from the sea. Later in life the ship was transformed into a coal barge and found its home in Pennekamp when an errant tug puller her onto the Elbow. A metal hoop is a common spot for divers to stop and have their pictures taken. 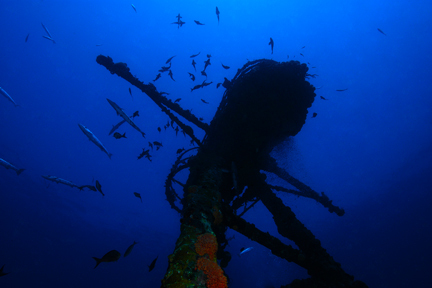 In 2002 the USS Spiegel Grove, a US Navy dock landing ship was intentionally sunk in 130 feet of water off Pennekamp. At 510 feet long the Spiegel is an impressive sight. Due to premature flooding the ship partially sank upside down and needed to be righted before the remainder of the vessel was allowed to go under the waves. Large intentionally sunk ships of this type have holes cut into the hull to allow scuba divers access in and out of the ship safely. Should something go wrong during the dive, exits to the open water are not far away. If the ship were allowed to sink upside down it could become disorienting to divers and a dangerous dive site. The sum of $250,000 was spent to attempt to right the ship. The best that could be done was to sink the Spiegel on its side. Three years later Hurricane Dennis would come along and rectify the problem by setting the ship perfectly upright. Just a mile southeast of Molasses reef and a half mile from her sister ship the US Coast Guard Cutter Bibb, rests the Cutter Duane. This spectacular artificial reef with rivers of snapper and grunts flowing up and down the sides of the ship is one of my favorite places to dive. Enormous green moray eels can be found hiding in large pipes. Nurse and bull sharks are regular visitors to the wreck but one resident in particular has captured my heart—a sea turtle. 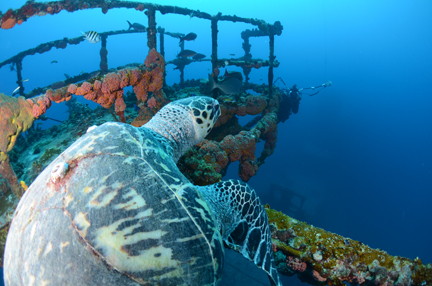 Sea turtles are not uncommon on ship wrecks and artificial reefs but this one in particular seems to love interacting with people. On a recent perfect summer day in paradise we were waiting for a mooring ball to become available on the Duane. The ship is not a huge wreck at 329 feet and only has three mooring balls tied to it; one at the bow, one at the stern and one amidships on the smokestack. As we waited, a turtle surfaced to get a breath and swam to my boat. We watched the turtle the turtle watched us and eventually dropped down back to the wreck. Armed with a GoPro® in a dive housing I commented on how I hoped to see the turtle again during the dive. What happened next was unbelievable. As I was descending the mooring line “my” turtle was coming up the mooring line. I knew it was my turtle because it had an arrangement of three barnacles on its shell just behind its head. We had noticed them while the turtle was at the surface near the boat. It was the same turtle. My assumption was that the turtle would pass me on its way to get fresh air. Instead it stopped about three feet from me, turned around, looked back at me as if to say, “Are you coming?,” and headed back towards the Duane. Who was I to argue? When you get that kind of invitation, you accept. So maintaining a respectable distance I kept my GoPro® trained on my new hard-shelled friend and together we swam the Duane for almost 10 minutes. We stopped on the side of the vessel where the turtle snacked on a few shellfish, continued towards the bow where we ran into a nurse shark. It promptly turned around and went in the opposite direction down to the sand at 122 feet and back up the side of the ship. Unfortunately, scuba diving comes with depth and time limitations and I had reached them both. Sadly, I had to wave goodbye as the turtle swam off into the open ocean. I thought that was the first and last time I would see this friendly turtle; happily, I was wrong. In the last six months we have swum the Duane together on a number of occasions. I have numerous photos and videos of the Duane’s turtle. The cover of this magazine was shot three months ago on a Duane dive where the current was significant; divers say it was “rippin.” As I was riding the current to the back of the vessel what do I see coming towards me but my old buddy the turtle! I got off one shot as we passed each other on that dive. We have visited a number of times since and I look forward to seeing the Duane’s turtle again. Dennis R. Deblois is living his childhood dream that arose from his passion for swimming in the lakes and rivers of his native New Hampshire. Living in the Florida Keys, scuba diving, and photographing above and below the waterline, Deblois is enjoying the life that would be the envy of many. The program The Undersea World of Jacques Cousteau and all things “ocean” fascinated him. He taught himself to be a scuba diver training in the family pool and learning from PADI (Professional Association of Diving Instructors), NAUI (National Association of Underwater Instructors), and YMCA manuals. Deblois has been on thousands of dives since he began diving at the age of 13. He is a PADI Master Diver who is rescue diver certified and he is an accomplished underwater photographer and videographer. He has traveled the world diving in Thailand’s Andaman Sea, Australia’s Great Barrier Reef, Mexico, the Galapagos, California and Florida from Jupiter to the Dry Tortugas. 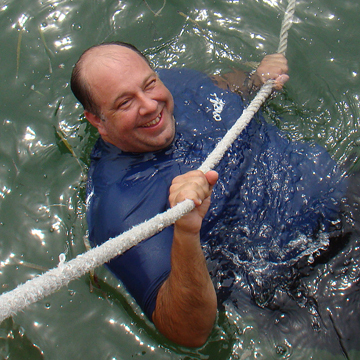 Professionally, Deblois has been CEO of International Data Consultants, Inc. He is a graduate of the University of Miami and with a BS in Chemistry and Marine Biology. Deblois uses a GoProert® Hero 4 in scuba housing for video; for still images he uses a Nikon D7000 in Aquatica housing with a Sea & Sea YS-D1 Dual Strobes Tokina 17-70 lens. His photos can be found at: www.imagesbydennis.com. 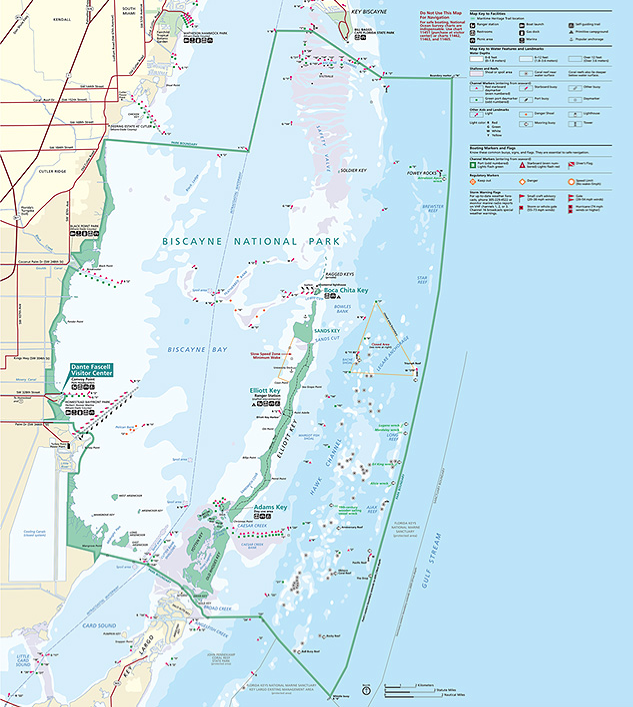 Just outside South Miami‘s door is BISCAYNE NATIONAL PARK. Composed of reefs, keys, the bay, and a fringe of land embroidering the mainland, the park is a wonder world with an array of delights and discoveries for boaters, divers, nature lovers, and history buffs. Encompassing 173,000 acres the park is unusual in the federal park system because 95 percent of it is covered by water. 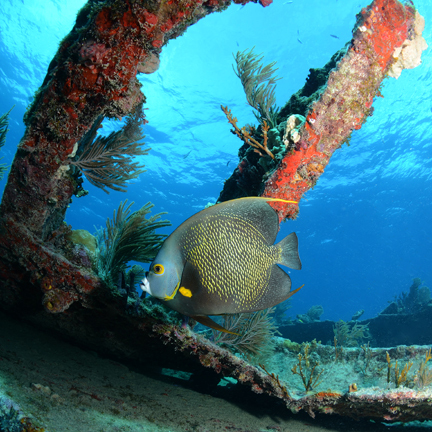 Wreck-diving is a major pastime in the Biscayne waters. There are six sites available to explore along the Maritime Heritage Trail, with ship remains spanning the 19th to the 20th centuries. 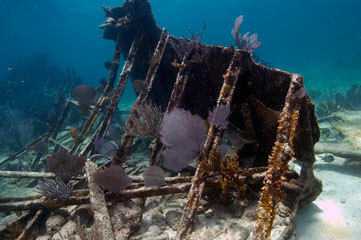 Ships have been running aground on the ancient coral reefs off southeast Florida for centuries. Modern aids to navigation, lighthouses, and accurate charts may have helped to reduce the number of wrecked vessels, yet it continues to this day. Since 1995 there have been 1,868 groundings within the park. Beginning in the north near the Fowey Rocks lighthouse running southward the Maritime Heritage Trail shipwrecks are: Arratoon Apcar (1861-1878), Lugano (1882-1913), Mandalay (1928-1966), Erl King (1865-1891), Alicia (1883-1905), and an unnamed 19th century wooden sailing ship. The sites are accessible by boat and most are located in depths that require scuba equipment to view. 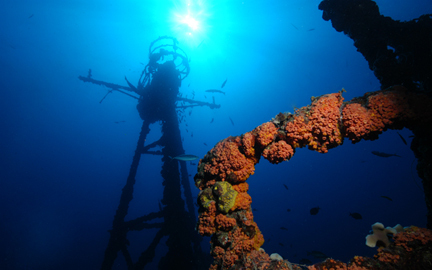 However, the depth of the Mandalay is in 10 to 15 feet of water, allowing those who snorkel to get a nice look of what remains of the 110-foot steel-hulled schooner. Originally built for Dr. Henry D. Lloyd of Brookline, Massachusetts, the ship went through a number of owners and name changes before it was purchased by Windjammer Cruises in 1965. Refitted and renamed, Mandalay began yet another life as a luxury cruise ship. 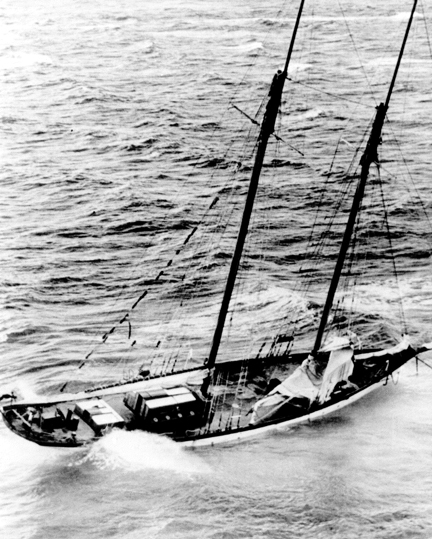 While cruising toward Miami from the Bahamas with 23 passengers and 12 crew members Mandalay ran aground on Long Reef in the early morning hours of January 1, 1966. The captain had gone to bed leaving a novice at the helm. Later the captain admitted that he had miscalculated and that the ship was 20 miles off course when the mishap occurred. The Coast Guard came to the rescue, removing passengers via helicopter from a ship stuck on a reef in windy conditions and 10-foot waves. Park rangers remind underwater visitors to “Take Only Pictures, Leave Only Bubbles.” For more information about the wrecks on the Maritime Heritage Trail including locations and instructions for access, please contact http://www.nps.gov/bisc/learn/historyculture/maritime-heritage-trail.htm. For general park information, please visit http://www.nps.gov/bisc. Mandalay on her side in shallow waters.